Google Street View image of Lodz Fabryczna Sept 2011. On 21 March, Google activated “Street View for Poland” – or more precisely for certain Polish cities and the main roads linking them. The images were taken over period of time; many of them in 2011. 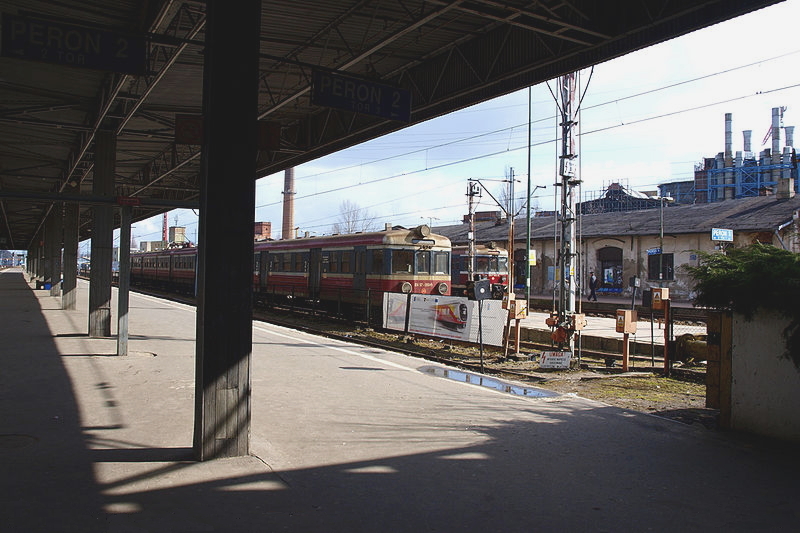 In Lodz, it is possible to see Lodz Fabryczna station as it was when the trains were still running and before the platforms were bulldozed to the ground. A hat-tip to the W-wa Jeziorki blog for the story. For those unfamiliar with ‘Street View’ follow the link below for Michael Dembinski’s excellent tutorial as to how to use it. This story was written in good faith, but based on inaccurate information supplied to BTWT at the time. 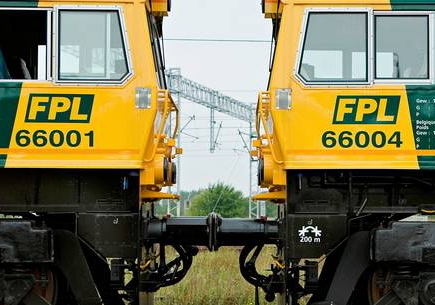 We withdraw unreservedly the comment that Freightliner PL ‘has yet to make a profit’ and that any suggestion that its owners may be looking for a quick sale. Freightliner PL Class 66 front ends. Photo Freightliner PL. Freightliner PL, the Freightliner group’s foray into mainland Europe, is to be sold. The move follows the company owners, Arcapita, filing for Chapter 11 on March 19. Arcapita formerly known as First Islamic Investment Bank listed assets of $3.06 billion and liabilities of $2.55 billion. Freightliner PL, was always going to be a long-term project. The company invested heavily in new locomotives and rolling stock and has yet to make a profit. Currently Arcapita needs cash urgently. The bank is under siege from hedge funds who have bought into its debt. The million dollar question is – who will be come forward to purchase Freightliner PL and at what price. The result will be a good indicator as to what PKP SA can expect to raise from the forthcoming privatisation of PKP Cargo? One obvious contender would be DB Schenker, though some analysts would say that by building up its road fleet DB Schenker is hedging its bets regarding its rail operations in Poland, and would be unlikely to make a bid for Freightliner PL unless at garage sale price. Px48-3913 being unloaded at Gryfice. Video by zyga1112111. At 7am on Saturday 24 March, Px48-3913 returned to Gryfice after more than 21 years in Germany. The locomotive, owned by entrepreneur Gerhard Kellner, moved to the Brohltalbahn near Koblenz in 1990. It worked on the Brohltalbahn until 2008, and was then moved to the MaLoWa workshop in Benndorf. It is part of a locomotive swap in which one of Gryfice’s Lxd2 diesel locomotives has moved to Germany in return. Px48-3913 will now receive a heavy overhaul and once complete there will be two operational steam locomotives available at Gryfice. The other is Px48-3916 which is owned by Warsaw Railway Museum but on long term loan to Gryfice. In the meantime major works are continuing on the Gryfice railway, including relaying the 11km coastal stretch, curve easements to allow faster running, building new stations at Trzesacz, Sliwin and Niechorze Latarnia, refurbishing the existing stations, and refurbishing the passenger coaches. It is not clear yet whether the works will be complete in time to run trains this summer; a second summer without narrow gauge trains seems to be a distinct possibility. The beginning of the end… Video by LodzTube. …or a new beginning? Video by LodzTube. The British-Polish Chamber of Commerce and the Lodz City Authority held a joint meeting at Lodz Town Hall on Monday 19 March about the redevelopment of Lodz Fabryczna station. The Mayor of Lodz, pointed out that roads and railways were a critical deciding factor in whether a region attracted external investment. The Chairman of PKP PLK showed plans and artist’s impressions of the new underground Lodz Fabryczna. The BPCC representative showed a PowerPoint presentation about major railway station investments around the world. As presentation followed presentation our BTWT reporter’s head began to nod. It had been a 05:00 hrs. start in Warsaw to catch the 06:40 TLK to get to Lodz Widzew for 08:20. Then a long walk to the tram stop and another long walk to the Town Hall. (The bus alternative involves three different buses and a 210m walk.) But then what was this? The BPCC speaker was ending his presentation on a high note. There are several similarities between Lodz and the Thames Valley area – a region with the lowest unemployment in the United Kingdom. Both areas lie to the West of their respective capitals, both are close to major airports, both have well-respected Universities. This was bang on target. It is fast trains and not railway stations that have a powerful effect on regional development. *There are 22 direct trains on weekdays between Lodz Widzew and Warszawa Centralna. The fastest journey time for the 126km (79 mile) journey is 1hr 29min, an average speed of 87km/h (55 mph). The fastest journey time for the 102 km (64 mile) from Oxford to London is 56 minutes, an average speed of 109 km/h (68 mph). SM42 loco and train at Rogowiec, 14 march. Photo SKPL. When Stowarzyszenie Kolejowych Przewozow Lokalnych (SKPL) – literally the Local Rail Haulage Association – was set up in 2001, its promoters hoped to take over all the narrow gauge lines that had been closed that year by PKP. Sadly few local authorities regarded their n.g. lines as anything more than a convenient land bank and in the end only a handful of lines were saved. Nevertheless SKPL managed to take over the operation of 7 n.g. lines – Kalisz, Krosniewice, Mlawa, Naleczow, Pleszew, Przeworsk and Smigiel – and an equal number reached the ‘serious discussion’ stage with their relevant local authorities. Today SKPL runs only three narrow gauge lines, but is building up its portfolio of standard gauge ‘short-lines’ – long sidings and branch lines on which it manages and runs freight operations. This is what 28 wagons look like from the cab! Photo SKPL. On 14 march, SKPL ran a test train of Ucs and Uacs wagons on the route: Piotrkow Trybunalski – Rogowiec – Piotrkow Trybunalski. 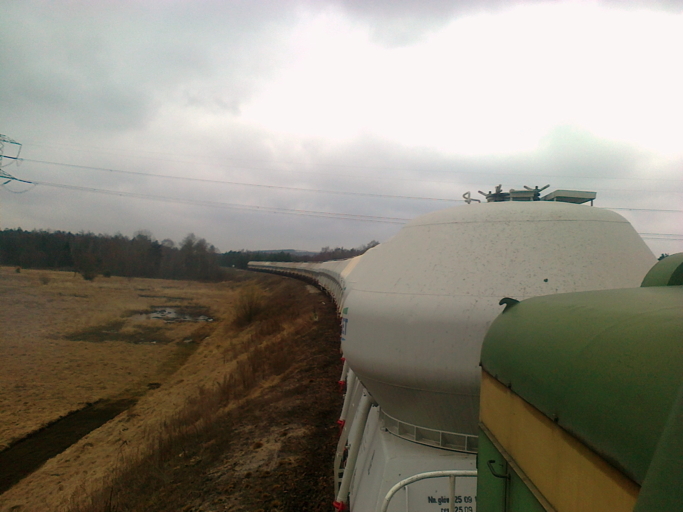 The wagons collected fly-ash from the power station at Belchatow. The Rogowiec – Piotrkow lines is not electrified. From Piotrkow another operator and an electric locomotive took the train of 28 wagons to Chelm, their ultimate destination. Let’s Help Repair the Line! The track after the theft. Photo FPKW. FPKW do not have the funds to make good the damage, so Poland’s longest operating narrow gauge railway, 49km long in total, has been reduced to an operating length of just 8km. The whole line is being regularly patrolled to try to prevent any further thefts, which become more likely when a section of railway railway is seen to be completely disused for any period of time. 1. Click on the PayPal banner on the FPKW homepage. 2. Enter the donation amount in zloty under ‘Kwota Darowizny’ (the current exchange rate is approximately 5 zl to £1). 3. Click the update button: ‘Aktualizuj sume’. 4. A second screen will appear. Check the donation amount in the top bar. 5. If you have a PayPal account, enter your login details in the box on the right, email address and password (‘Haslo’), then click ‘Zaloguj sie’ (log in). 6. If you don’t have a PayPal account, click ‘Kontynuuj’ above the credit card symbols to pay by credit card. On the next screen, UK citizens should select ‘Wielka Brytania’ for ‘Kraj’ (Country). This will change the rest of the form to English. Enter the rest of your payment and address details. Click ‘Review Donation and Continue’. 7. Whether you have logged into your PayPal account or entered your credit or debit card details, the next screen shows the donation amount in pounds sterling. This is the amount that will be taken from your credit/debit card. Check that you are happy with it then click the ‘Donate’ button. Autumn magic, Lyd1 and train. Photo FPKW. In the meantime, the tourist season will commence as planned on 29 April, but trains will run on a modified timetable using only the Rogow to Jezow section of the line. Four return trips will run every Sunday until 30 September, and also on 1, 2 and 3 May. Robert Hall’s route from Radom to Lodz Fabryczna. Map courtesy Railmap. After a night in an agreeable hotel in Radom, only a couple of minutes’ walk from the station, I set off to Lodz the following morning, Monday 26 July. Armed with a packed breakfast provided by the hotel, I caught the 07:27 through local train Radom – Tomaszow Mazowiecki – Lodz. At the time, this was the only through westbound train of the day; it had an eastbound counterpart which ran in the evening. There is a meagre selection of other trains on the line, but no other trains run the full length. The EMU departed punctually, for a delightful early-morning, all-stations run through pleasant countryside. Whilst passenger workings on this route may be few and far between, in the course of the journey we did pass a number of long-distance freights, and I noticed timber being loaded into PKP Cargo wagons at Wykno. It was cheering to see these all rail freight activities after my experiences on other secondary lines during this visit to Poland. EMUs at Lodz Fabryczna shortly before closure. Photo Wiktor Baron. I arrived at Lodz Fabryczna station at 10:41, where Dyspozytor and his car were waiting. A fine coup had been achieved: we were off to Zdunska Wola some 40 km to the west, and neighbouring Karsznice, for a visit to the little-known standard-gauge ‘skansen’ (open air museum) at the latter location. The railway museum, formerly under PKP control, has only recently been transferred to the Zdunska Wola municipality. Our first stop was the Zdunska Wola Museum in the centre of town. The railway museum for administration purposes is now part of the town museum. We were met by the town’s museum director, under whose remit the railway museum now falls. We were given a tour of this most interesting museum which tell the history of this textile town which is something of a junior partner of Lodz, and then, with Piotr Skorek of the Zdunska Wola museum staff as our guide, we continued to the railway museum at Karsznice, a few kilometres to the South. The Karsnice ‘skansen’ in 2006. Photo BTWT. Until recently the railway museum was an integral part of Karsznice loco depot and railway workshops. Karsznice is a railway town, built for the Magistrala Weglowa (Upper Silesia – Gdynia coal railway) in the 1930s. It was a convenient point for exchanges of locos and crews, on the long run between the coal mines and the seaport. It was a great privilege to see round Karsznice railway museum, which at the time of my visit was not open to the public at all; its Skierniewice counterpart can at least be visited a few days in the year. The previous workshop manager had set out to collect one example of each of the engines that used to work on the coal line and was one engine short when he received his redundancy notice. I spotted five out of the seven standard-gauge steam classes which were still active in the 1980s. The exceptions were class TKt48 2-8-2T, and class Ty51 2-10-0, and plentiful examples of both clases are preserved elsewhere. There was also Ty23-237, a Polish ‘home-grown’ 2-10-0 freight hauler. A few specimens of this class were active on PKP till the late 1970s. Also still in use in the late 1970s, were the massive American-built class Ty246 2-10-0, fitted with a mechanical stoker. These were built to make good World War II losses in the brief time-window before it all went nasty between the West and the Soviet Union. I understand that some features of class Ty246 were used in the design of the later Ty51. Besides the steam locomotives there were also an assortment of diesel locos and railcars, and passenger stock, some of considerable antiquity. Most unfortunately, there is at present no alternative to all these exhibits being kept permanently out in the open air. In addition, the museum’s future is entirely in the hands of the local council, who are at present supportive but there is no guarantee that this attitude will continue indefinitely, or even for long, given the situations faced by other Polish rail heritage assets in local authority care. We drove back to Lodz via country roads with a coffee-and-ice-cream stop in a little town en route. You can’t cover everything – it turned out that something had to give, and the victim was Lodz’s wonderful metre-gauge tram system. In the end, time didn’t allow us to do the epic interurban run north to Ozorkow. So I was not able to enjoy as much of the Lodz tram network as planned, but those fragments I did experience were cherished. A great inducement for another visit to Poland. The start of the interurban line to Konstantynow and Lutomersk at Zdrowie. The Lodz MPK trams turn right here and go round a loop. Note the Tramwaje Podmiejskie logo on the tram. Photo BTWT. I did see a fair amount of the interurban tram line to Lutomiersk (featured in ‘A return journey – part 3‘) which is shorter than the Ozorkow line, but no small-time spur. At the time of my visit, the Lutomiersk tram route was temporarily interrupted over the central stretch near Konstantynow while road works were being carried out. Buses were bridging the gap, something of a discouragement to travel. We travelled alongside the line for some distance by car, on journeys on two different days. On the journey to Zbiersk on July 19th we examined the route’s end, a loop in Lutomiersk town square. During our journey to Zdunska Wola on the 26th we also followed part of the line, and made a call at the interurban route’s depot on the west side of Lodz. We had a chat and a coffee with the hospitable general manager and had a walk round the depot under the guidance of the chief engineer. At the depot we saw service vehicles of very considerable antiquity, converted from tramcars. And so dawned Tuesday 27th, my last day in Poland. For complicated reasons, I had arrived in Poznan by air, but departed by rail. I had a few hours left for a farewell trip before my train in the evening. Having developed a fondness for leisurely journeys along electric lines by local EMU, I decided on a local-EMU odyssey as a fitting farewell to Poland, so I took a tram to Lodz Kaliszka station, and left Lodz on the 13:33 EMU, arriving in Poznan Glowny at 18:45, in plenty of time for the westbound night express due out of Poznan at 21:33. The local EMUs seem basically ageless and unchanging, the same now as they were in 1980, and give a fairly comfortable ride. Who cares if it takes many hours of watching the beguiling Polish rural scene out of the window to arrive at one’s destination? Lines important enough to have been electrified also seem to have more action happening on them, including freight, than the depressing and seemingly dying non-electrified lines. I enjoyed the long-distance EMU run. The train reversed in a leisurely fashion with a long lay-over at Ostrow Wielkopolski. A tank engine, 2-6-0T TKi3-120, was plinthed on the platform there. Pleszew was next. SKPL’s passenger service on this line was suspended for the summer, but I looked out eagerly for the 750mm gauge track, having a vague memory of seeing it in passing twenty years previously, but saw none this time. Some way further north, Ol49-1 was plinthed at Jarocin, appropriately as Jarocin was the last place in Poland (with the exception of Wolsztyn) with completely genuine steam workings, until early 1992, mostly with class Ol49. At Sroda I was dozing, so missed a potential glimpse of the still-active 750mm gauge line. And so I arrived in Poznan with time to get things straight, have a bite to eat, and prepare to board the Jan Kiepura express to the west, the first leg of my homeward journey. I was to leave the Jan Kiepura at Köln, and the journey until the far west of Germany was in darkness. I confess to being someone who lives firmly in the past, taking not much pleasure or interest in the ultra-modern railway scene. For me, even the Channel Tunnel, through which I have travelled several times, is a convenience rather than a thing of joy. The Kiepura arrived at Poznan punctually, having started its run in Warsaw. It is designated, impressively, a ‘Hotel’ train, and its spacious accommodation, even in second class, certainly felt hotel-like after a long diet of Polish local trains with their comfortable enough but not overly expansive seating (and, as for the narrow gauge, comfort is not the object of that exercise). The reservation, obtained when booking the ticket in Britain a month previously, worked like a charm, and departure was punctual at 21:33. With a long and quite intensive grice having taken its toll, I slept most of the night, completely unaware of the Polish-German border, and woke up briefly only at the key points of Berlin, Hannover, Hamm, and Essen. I had something over an hour in Köln, awaiting my train on to Brussels – an opportunity for some breakfast. My Brussels train, coming in from further afield, was formed of highly modern and thoroughly comfortable stock. As at Poznan, the seat-reservation had worked smoothly, but my heart sank when an announcement was made that departure would be delayed because of a coupling-related fault on the train. My connection with Eurostar at Brussels was a little tight, and being given to travel-related panic, my imagination went into overdrive regarding what is done with passengers who miss their booked Eurostar because of the late running of their preceding train. The coupling fault was quite promptly remedied, and we set off about a quarter of an hour late. All being well, the Brussels connection would still be okay. Shortly after Aachen, a change in the style of station-signage revealed that we had crossed into Belgium. I had hoped for some nice hill scenery in this far-eastern part of Belgium, but nowadays a great deal of the run between Aachen and Liege is in tunnel. Interchange to Eurostar at Brussels Midi was accompanied with check-in procedures identical to an airport, and after boarding the Eurostar, departure for London St. Pancras via Lille was punctual. After a journey through unexciting scenery then through the ‘big rat-hole’, arrival was at about half past noon, my first time arriving by Eurostar into St Pancras, as the last time I had travelled by Eurostar the terminus had still been at Waterloo. With a short walk to Euston, the next train to Birmingham New Street, and a suburban train to my local station, I reached home. It had taken six trains and 24-plus-a-few hours, to get from Lodz Kaliska to Chester Road on the Birmingham – Lichfield line, with electric traction all the way. In the wake of last week’s catastrophic accident at Szczekociny, former Transport Minister, Jerzy Polaczyk, has requested that the Urzad Transport Kolejowy (Office of the Railway Transport Regulator) be investigated by the Najwysza Izba Kontroli (National Audit Office). In his submission Polaczyk has pointed out that in 2010, a person without any railway or practical experience was appointed to the Chair of UTK in direct contravention of the requirements stipulated in the relevant railway transport Act. Subsequently writes Nowak, that person was fired, but not before she had dismissed all 7 of the UTK’s regional directors. People with no railway experience whatsoever were brought in on short-term (and expensive!) contracts and experienced staff started to leave. The result was a management vacuum which led compromised UTK’s ability to oversee the effectiveness of the safety regime on the railway, at a time when railway companies were slimming down their own safety officers and cutting back on training. Infrastructure Minister Slawomir Nowak has responded quickly to the possibility of a NIK inspection. On Monday, Marek Slowikowski was appointed to the position of Director General of UTK, a post he had been occupying in an acting capacity for several months. On Friday, UTK announced that it is calling for candidates to apply for the post of Chair of UTK – a position that has been vacant since January this year. BTWT readers who feel they have the necessary qualifications may download the job description and application procedures from the UTK’s website here. Test run between Rudy and Stanica. Video by Bartholomeo1980. On Saturday 3 March, Lyd2-101 made a test run from Rudy to Stanica with a Romanian coach and several passengers. Everything went smoothly, and depending on the weather, the official opening of the 2012 season could take place before the end of March. The Rudy narrow gauge railway, near Kuznia Raciborska in Upper Silesia, is a surviving remnant of the once extensive Upper Silesian 785mm narrow gauge network. The passenger service between Gliwice and Rudy was both the busiest and the last surviving on the network, with the exception of the summer tourist trains at Bytom. At its height in 1954, the line carried 1.8 million passengers, and annual passenger numbers did not fall below 1 million until 1964. The Gliwice to Rudy passenger service ceased in 1991 and even in that year it carried 90,000 passengers, or around 250 passengers per day, which would be a healthy figure for some of Poland’s standard gauge branches in 2012! Today Rudy’s locomotive sheds, yard and station buildings have been turned into a successful museum which is operated by the Municipal Centre of Culture, Sport and Recreation (MOKSiR) of Kuznia Raciborska and enjoys strong local authority support. 6km of the railway remains open, between the stations of Paproc, Rudy and Stanica. During the tourist season which runs from spring to autumn, trains run from Rudy to Paproc daily except Mondays when the museum is closed, and trains also run to Stanica on Sundays. The Rudy museum has been going from strength to strength in the past few years. Visitor numbers have increased dramatically from 5,000 in 2009 to over 20,000 in 2011. Local authority funding enabled the repair of some of the dilapidated station buildings and the museum has obtained a fairly impressive collection of 785mm gauge rolling stock. 0-6-0 steam locomotive Las 49 was restored to working order in 2010 and is steamed on summer Sundays. Lyd2-101 was regauged from 750mm to 785mm gauge over the winter and had its first test runs in January. 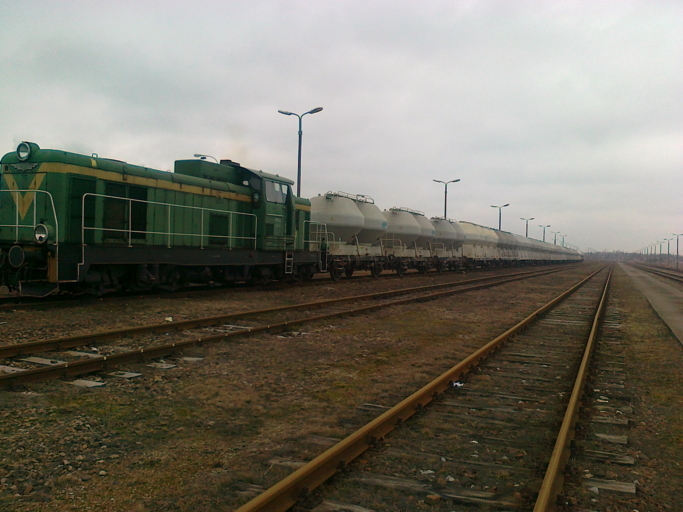 At the end of January, Rudy obtained the three remaining Lxd2 diesel locomotives from the closed Huta Pokoj (Pokoj steelworks) railway in Ruda Slaska: HP-Lxd2-08, 09 and 11. Most exciting of all, in October 2011 the four municipalities of Gliwice, Pilchowice, Kuznia Raciborska and Rybnik signed a joint agreement on a preliminary feasibility study into reconstructing the Gliwice to Rudy line, and constructing a new line from Rudy to Rybnik. There are obviously huge challenges to this project which would certainly require external funding, but it is an exciting possibility. The accident site the following morning. Photo zawiercie.naszemiasto.pl. At 20:57 on Saturday 3 March, two passenger trains collided near the small town of Szczekociny in Slask province. IR 13126 – the 18:18 ex Warszawa Wschodnia to Krakow Glowny – collided head on with TLK 31100 – the 14:46 ex Przemysly Glowny to Warszawa Wschodnia. The disaster is Poland’s most serious railway accident since the ‘Ursus’ accident of 1990. 16 passengers are reported killed – 9 of whom have been identified; 57 injured passengers were taken to 14 different hospitals – 3 are in a critical state. Low profile role played by (and given to!) the UTK (Office of Rail Transport), Poland’s rail regulator. UTK is currently without a Chief Executive! Fragmented responsibilities caused by fragmented rail industry. A comparable spate of accidents occurred in the UK after British Rail a upa and privatised. A ‘Command and control’ management culture where the views of the staff responsible for service delivery are ignored by middle and senior management. 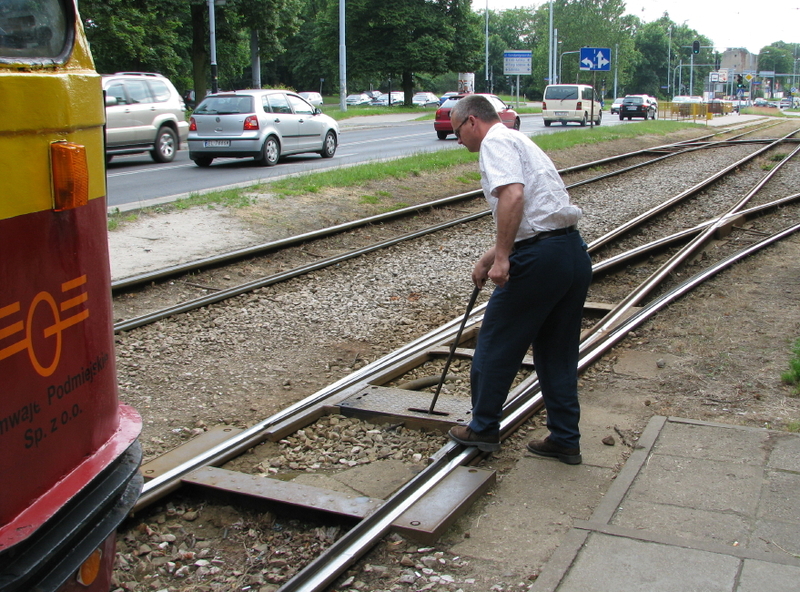 Inadequate funding for Poland’s railway infrastructure. Those funds that are voted by the Sejm (Poland’s parliament) not trickling down to where it is needed, but used to pay off PKP’s debts. Poland’s president Bronislaw Komorowski has declared the 5 and 6 March day’s of national mourning. Is it too much to hope that some good may come from this dreadful tragedy and that Prime Minister Tusk and his ministers will rethink government policy with respect to Poland’s beleaguered railways? Railmap map showing the location of Szczekociny. 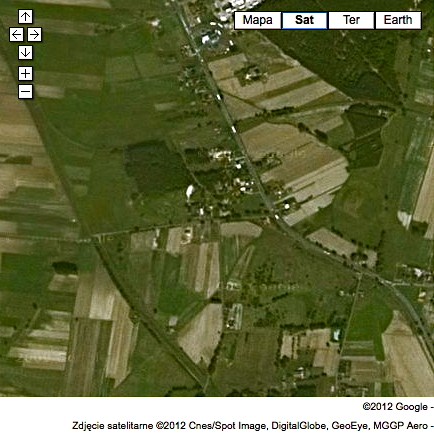 Digitally enchanced location 12 courtesy Google Satellite View. Look at the layout here as shown on the Railmap – Kolejowa Mapa Polski website. Click on the link and when the map showing Sierpow and Sierpow Waskotorowyopens click the “RM Map” button – the last but one of the six buttons on the top right of the picture. Google Map and Railmap hybrid map. Now thanks to Inzynier and Ross we know some of the answers. It is a mapping error, the narrow gauge line to Lesmierz and beyond did peel of southwards and ran alongside the road to Lesmierz. 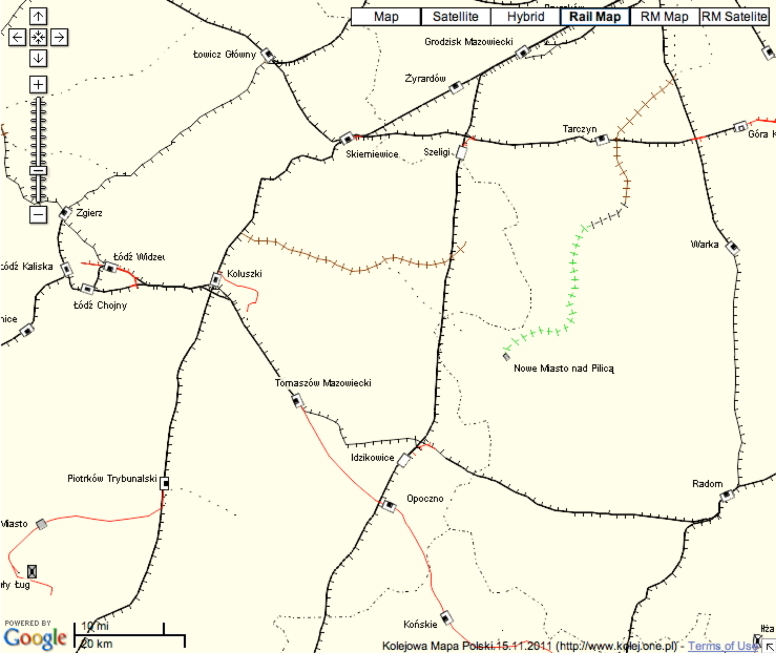 The Railmap cartographer assumed incorrectly that the post-WWII standard gauge line to the Lesmierz sugar refinery followed the line of the older narrow gauge connection. Inzynier confirms that several other sugar refineries to the East had their lines connected to the Lesmierz system quite soon after WW II. He has written an article about the Lesmierz sugar beet lines which, when we have sorted out appropriate photographs, we hope to publish shortly. But that is not the only mystery! Looking at the Google Maps mapping (Click the image at the head of the article and then choose “Map”.) 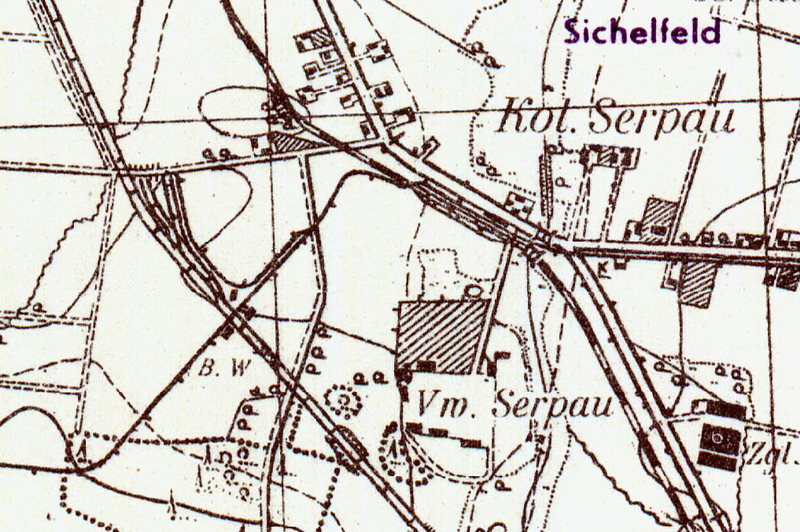 shows a standard gauge branch line apparently terminating in the hamlet of Lubien, the rubrik kopalnia rudy zelaza (iron ore mine) helpfully identifies the purpose of the branch – or does it? 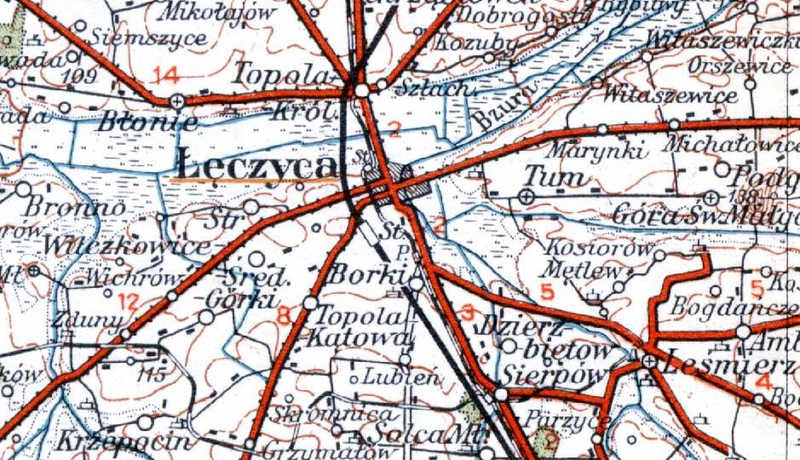 Leczyca area, 1934 1:300,000 map courtesy WIG archive. Inzynier sent us a copy of the WIG mapping for the area. It confirmed what we had expected: the Lesmierz sugar beet extended to the West of the standard gauge Kutno – Lodz line. But we had no idea how far the system had once extended! Thanks to Ross, who demonstrated more patience and skill with Google than we did, we now know that the standard gauge line leads to the Leznica Wielka airbase, the home of the 37 Dywizjon Lotnicze (37th Air Squadron). 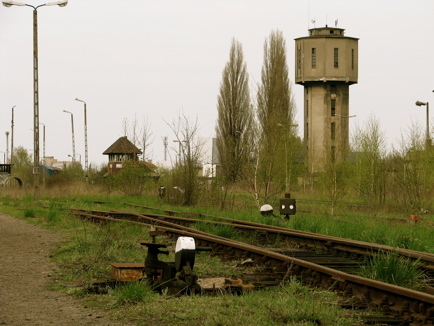 Water Tower at Leszno Works, April 2011. Photo BTWT. There is a rather poignant piece about the fate of old water towers in the current edition of New Poland Express. Graham Crawford, NPE’s regional news editor waxes lyrical about the potential of the old structures to be adapted for new roles. Last week I spotted a story about other crumbling treasures – old water towers in Slask. Flicking through the pictures, you can clearly see an attention to beauty beyond the merely functional that was frequently missing from the heartless utilitarianism of the communist period. Now they’re mostly suffering at the hands of untrammelled capitalism. To their credit, many of the local authorities have realised how potentially valuable these extraordinary structures are; how much a part of the landscape of their towns they are, and have plans to put museums and restaurants and other things inside them. The problem is finding the investors. Let’s hope PKP gets round to protecting its heritage, and that the economic crisis ends in time for these architectural jewels. This is all very admirable and we are delighted that the NPE is adding its voice to the clamour that PKP take a more responsible view of that portion of Poland’s industrial heritage which is in its custody. However, the fundamental problem is that since PKP was ‘commercialised’ and ‘restructured’ prior to privatisation, neither the main holding company, PKP SA, nor any of its myriad subsidiaries’, feels under any legal obligation to pursue any objectives other than maximising short-term revenue. 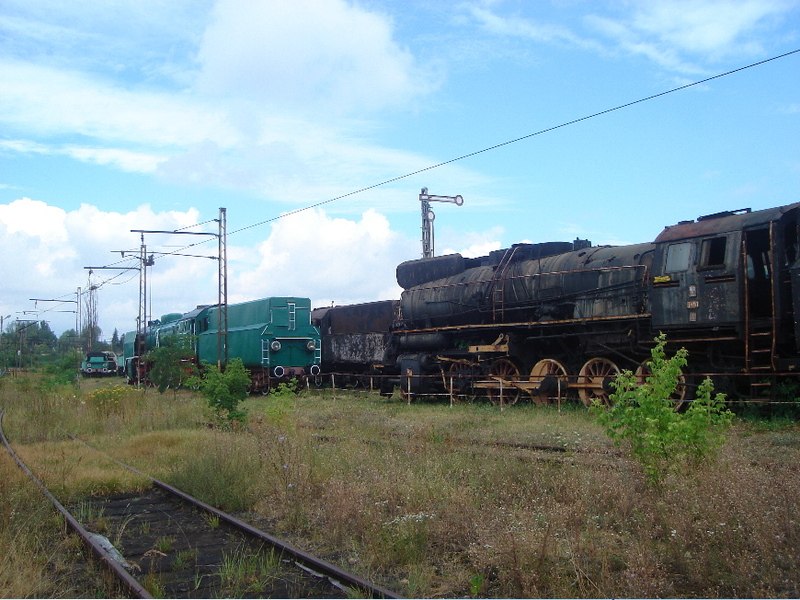 The consequences of this can be seen in the wanton destruction of much of Poland’s railway heritage all around Poland. Abandoned by his townspeople, Marshall Will Kane (Gary Cooper) sets out alone to meet Frank Miller, his deadly enemy. Original publicity photo. BTWT was set up as a campaigning blog, and over the years our readers have responded generously to our various appeals. Now it really is ‘high noon’ for Pyskowice and I would urge everyone who has enjoyed our blog to write to Maria Wasiak, the head of PKP, and most important of all, send a copy of your letter to Andrzej Massel, the Minister responsible for Poland’s railways. A a guide, a copy of John Savery’s own letter is reproduced below, but please write your own letters in your own words. Many thanks to everybody who responds to this appeal. I am writing you to express my concern with the actions of PKP SA against Towarzystwo Ochrony Zabytków Kolejnictwa i Organizacji Skansenów in Pyskowice (TOZKiOS). My understanding is that PKP are currently engaged in a legal dispute with TOZKiOS, and are attempting to evict them from their base at the former locomotive depot at Pyskowice. I visit Poland regularly to use, and view its railways and railway preservation societies. The current legal dispute, and the actions of PKP disturb me. TOZKiOS had an agreement in place with the local PKP management team to use the shed area for a nominal rent. By demanding a commercial rent, and back payments of rent dating back a number of years, the actions of PKP threaten the very existence of TOZKiOS, undoing the fantastic work that they have achieved over the last 14 years, in establishing a railway museum in the old depot at Pyskowice. Not only do the actions of PKP threaten the existence of the society, they also threaten the existence of the remaining buildings at Pyskowice, which are on the register of historic buildings and monuments. The museum at Pyskowice is well known to fans of Polish railways, both in Poland and abroad. It has the potential to be an excellent tourist attraction in the area, preserving historical artifacts. The actions of PKP threaten this. I understand that PKP has a liability to pay taxes to the local authority for occupying the land, and that the payment of rent is designed to cover these taxes. I also understand that PKP is legally obliged to act in a commercial manner. The land at Pyskowice has an extremely limited commercial value, due to its location in a desolate industrial area. The lack of road access limits alternative uses. The simplest solution would be to grant the title of the land to TOZKiOS, removing the obligation from PKP to pay the taxes to the local authority. This would reduce the tax liability on PKP, and provide the security of tenure that the society deserves and requires in order to be successful. I realise that in some localities that the transfer of redundant PKP assets has been done to the local authority, however my understanding of the Polish law is that there is nothing to stop the transfer taking place to a society or museum. To me, this would result in a win-win situation. PKP wins and can be seen to be acting commercially by reducing its tax liability and disposing of land that has little commercial value. The society wins by having the security of tenure and a permenant base. The next round of the court case is set for 21 April, in Gliwice. I would urge you to intervene before this date, drop the demand for a commercial rental on the buildings and land area, and grant TOZKiOS the tenure of the land and buildings free of charge.